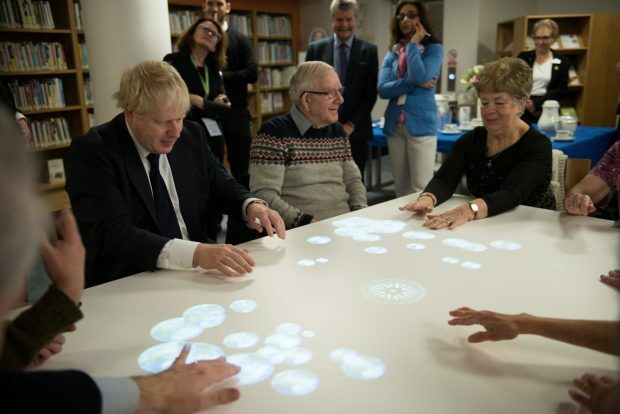 On Friday 24 November Uxbridge Library officially unveiled the first Tovertafel, which translates as magic table, in a public library anywhere in the world. The launch was part of our regular dementia friendly coffee morning with special guests including Boris Johnson, MP for Uxbridge and South Ruislip, Councillor Ray Puddifoot MBE, the leader of Hillingdon Council, John Ramsay, the CEO of Shift 8, the UK distributor for Tovertafel and Cherry Bushell of the Alzheimer’s Society. So what is the Tovertafel? It is a ceiling mounted projector that projects light games onto a standard everyday table. People can interact with the images of the games using their hands and arms. It was developed in Holland by as part of PhD research by Hester Le Riche at the Delft University of Technology (TU Delft). It is made by Active Cues and distributed in the UK by Shift 8.